Burgeoning agent Jay-Z is wooing Los Angeles Dodgers star Yasiel Puig, hoping to add the 22-year-old to the growing stable of athletes he represents, two sources told Yahoo! Sports. During a mid-June trip to New York, Puig was invited to a party at a club Jay-Z owns after a Dodgers teammate passed along the rapper's contact information, one source said. 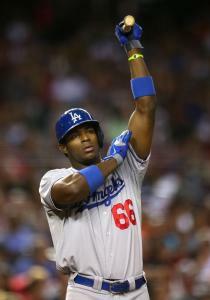 Between the lifestyle and marketing plan offered by Roc Nation Sports, Puig left the meeting intrigued. While Puig has spoken with at least one more marketing agency in New York, the prospect of his joining Roc Nation as a client covering both baseball contracts and marketing remains a possibility, sources said. After signing New York Yankees second baseman Robinson Cano as his first client, Jay-Z – who made the bulk of his half-billion-dollar fortune in the music industry – has targeted players from other sports: Thunder star Kevin Durant, WNBA rookie Skylar Diggins, and Jets quarterback Geno Smith. Jay-Z also is known to be interested in signing another Cuban baseball player, Oakland A's outfielder Yoenis Cespedes, according to a source. Next week, Cespedes will be in New York, Jay-Z's hometown, for the Home Run Derby, and Puig could be as well if he wins the Final Vote for the last slot on the National League All-Star team. In the song "Crown" on his recently released album, Magna Carta Holy Grail, Jay-Z took a shot at prominent baseball agent Scott Boras, rapping: "Scott Boras, you over, baby. Robinson Cano, you coming with me." While Boras declined to fire back, agents around baseball have questioned the wisdom in signing with a fledgling agency run by somebody with no experience negotiating sports contracts. Roc Nation Sports has partnered on the baseball side with Creative Artists Agency. Were Puig to leave for Roc Nation, his current agent, Jaime Torres, would receive the full commission on the seven-year, $42 million deal signed in June 2012.